Although I’ve been conscientiously recording my preparation for, and evaluation of, the Storytime at the Library sessions I’m doing with pre-schoolers, it occurred to me recently that I’m also intuitively adding lots of incidental literacy activities I don’t write down. So today’s post is about simple and enjoyable games and activities you can use with your kids that will contribute to their literacy skills. Lots of these can be done in a few moments, making them handy for those times you’re waiting for an appointment, or even when kids are in the bath. 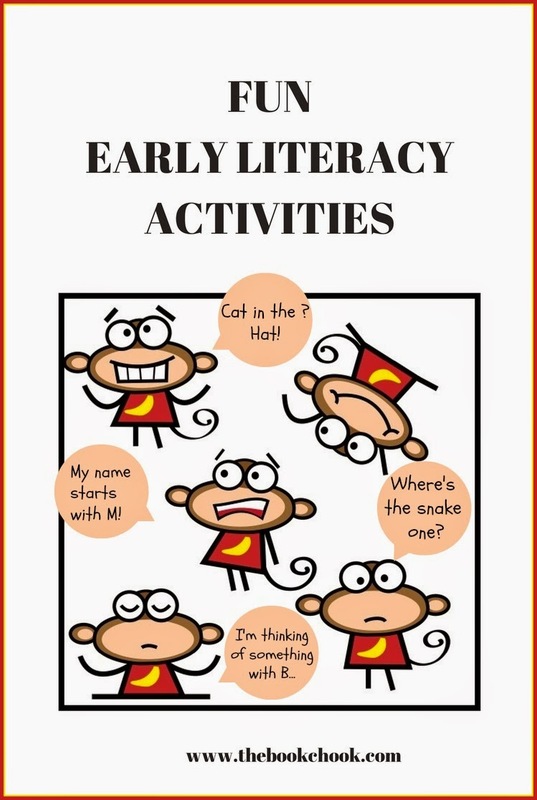 Probably the most important thing to remember is that literacy and literature activities are meant to be fun. Playing games is fun; drill is not. As parents, we should never to set up situations for little ones where it becomes stressful. If it does, we should stop. It’s also important to pick up on when our children are telling us they aren’t interested right then, or they’re tired or not ready developmentally for something. Most of the activities below can be played as games, perhaps during shared reading or a family game time. One of the activities you can do when out and about is to take notice of signs or other forms of print in the environment. Point out signs, and perhaps your youngster might notice a letter he knows. Play a game where you both try to be the first to find a special letter on the way to the park, or on cars. Very often this will be the one at the start of his name. Become collectors of words as kids get older - if it’s something that interests them, they can even take photos of words and letters they find, or record them in a little note book. I Spy is also a great game to play as children begin to understand beginning sounds. Print in the home is good for games too. Magnet letters on the fridge can be used for matching, finding, or when kids are older, writing little words or simple stories. It’s fun to play a hide-and-seek game where you choose a letter and say “I’m going to hide the “S” today, so close your eyes and no peeking!” I love alphabet blocks, or DUPLO with letters taped to each brick, too. Play building towers, or other fun things, and mention blocks casually - “Can you pass me the red “B” block?” or “If we put the “F” block on top, will the tower fall?” I like to use names of letters as well as the sounds they make when I’m referring to them, depending on what kids are ready for. Rhyming is amazing fun! Find rhyming picture books and on a second read-through, leave out some rhyming words to see if your child can remember them. Play games with rhymes - rhyming couplets about your child will tickle his funny bone: “My little pickle likes to tickle.” Or maybe a riddle: “This rhymes with cake and starts with “S”. What is it?” It’s important to incorporate rhymes, songs and chants into children’s lives too. Little books of nursery rhymes make a great start, or find rhymes and songs on Youtube. As kids get older, be sure to include poetry and quality rhyming picture books in their regular reading diet. Often I'll try to have the children think about the front cover of a book, and tell me what they believe it’s going to be about. I "accept" all answers - it’s not so much about right and wrong, as having a guess, and using clues. Sometimes, we look at several book covers to see if we can find differences and similarities. Perhaps two books might have birds on the cover, and the third has a lion. This is an important thinking skill, and can be incorporated into lots of everyday activities. You can try it at the beach with shells and a rock, or with 3 toys with wheels and one without. I make this a game by being the silliest guesser you’ve ever encountered, and children love to set me straight. I always start with a hidden object in the story bag, and have kids predict what it might be. Sometimes I give clues. It’s quite often a puppet, toy or object that has some significance to one of the books we’re sharing in that session. The children also love to hide an object for others to find - in future, I may introduce cards with a letter on for hiding. Storytime is not supposed to be about teaching kids to read, but if activities are in the form of a game, and its fun, then I believe it fits in with the spirit of Storytime. Pre-schoolers love to help bring a story to life with some kind of drama. I try to incorporate drama into any read aloud, especially in Storytime. This can be as simple as having kids join in an action part of the story, to re-telling a rhyme or story by acting it out. I love to find children’s picture books with strong rhythm and rhyme, not only because my preschool kids respond to them with enthusiasm, but also because these books help embed language into kids’ heads. At home, children can use toys to act out stories or re-tell them too. Do you have a favourite fun literacy activity you do with children? Please share in comments or on The Book Chook Facebook page.